Watercolour, attributed to William Prinsep (1794-1874), of two massive rocks at Orchha in Madhya Pradesh, dated 1818. 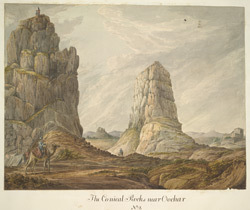 The image is inscribed below: 'The Conical Rocks near Oochar. No. 2.' This view shows one of the rocks with two soldiers on the top and in the foreground a mounted trooper of the Dromedary Corps. Orchha, meaning 'hidden place', is situated near the Betwa river and the area is famous for its pinkish-grey granite outcrops of rock. Orchha's Fort complex contains the Raj Mahal , the Rai Praveen Mahal and the Jahangir Mahal. William Prinsep, who worked for the Calcutta firm of Palmer & Co., came from a family who served in India for several generations. After the collapse of the company he worked as an indigo broker, was on the board of the Assam Company and was credited with the establishment of the Indian Tea industry as well as establishing the Bengal Coal Company and inheriting the Bengal Salt Company on the death of his brother George.